I read your article "Life with George" in the news letter of Summer 2000 of UCL. I decided to write to you a few lines about prof. George Keeton. In the twenties I was a law student registered in UCL. 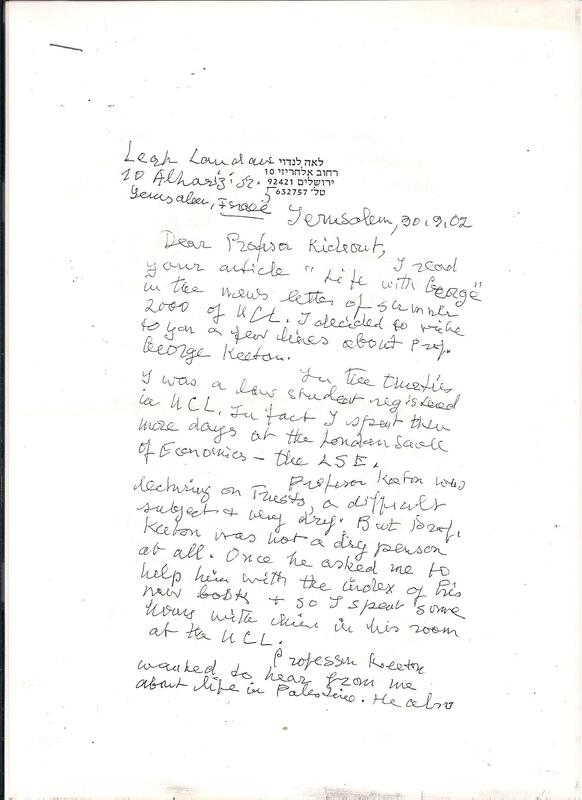 In fact I spent then more days at the London School of Economics – the LSE. Professor Keaton was lecturing on trusts, a difficult subject and very dry. But prof. K was not a dry person at all. Once he asked me to help him with the index of his new book + so I spent some hours with him at his room at the UCL. Prof. Keeton wanted to hear from me about life in Palestine. He also wanted to hear from me what were my interest apart from the law: did I listen to music, did I attend concerts. Without any provocation on my part he told me about his private life and about his wife who apparently was a dull person. 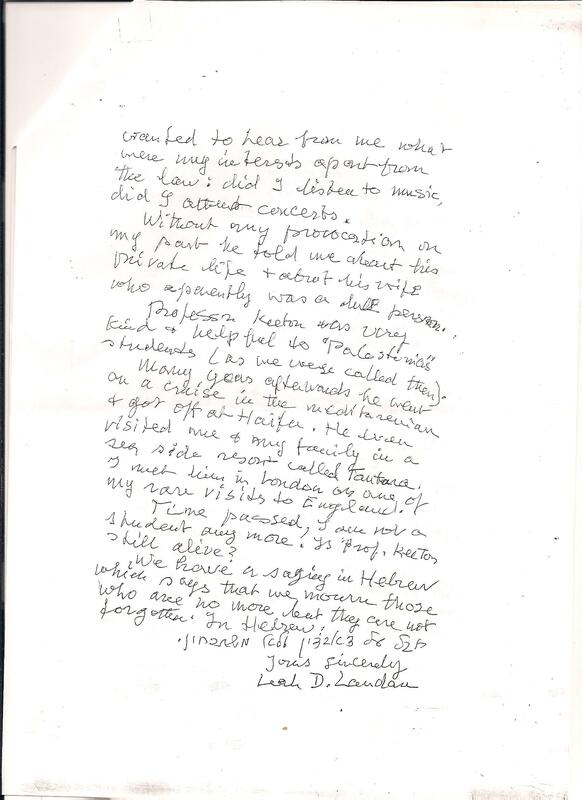 Professor Keeton was very kind & helpful to "Palestinians" students (as we were called then). Many years afterwards he went on a cruise in the Mediterranean and got off at Haifa. He then visited me and my family in a seaside resort called Tantura. I met him in London on one of my rare visits to England. Time passed, I'm not a student anymore. Is Prof. Keeton still alive? We have a saying in Hebrew which says that we mourn those who are no more. But they are not forgotten. In Hebrew חבל על דאבלין ולא משתכחין. ערך זה פורסם ב-זכרונות ב- 5 באוקטובר 2014 על ידי johnsonneri.